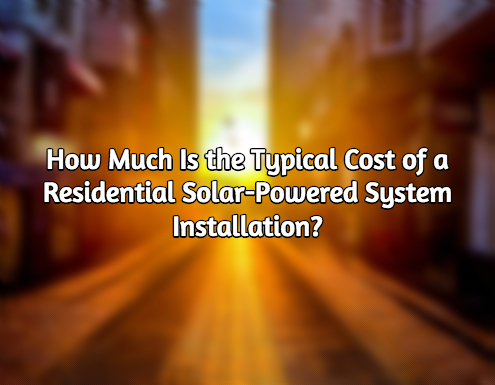 How Much Is the Cost of Residential Solar-Powered System? There are those whose primary reason for getting solar-powered electric systems is a desire to go green. That being said, the chief motivating factor for most is still economy. Solar-powered systems are widely appreciated as economically-sound solutions for those who wish to cut their power bills. That is, they provide an alternative or supplementary power source to the metered (and expensive) regular power grid. This reduction of dependence on the power companies is intended to result in savings over time. But it can be hard to figure out how long those savings take to pay back the investment if one has no idea what that investment might be worth. This is why most homeowners interested in solar panel installation always ask about the typical cost involved in residential projects. Clarifying the Query: What Is Typical? In order to figure out what a typical installation (and its cost) is, one needs to know what a typical homeowner—and by extension, his home—would require. It can be hard to figure out precisely what the average home is; socioeconomic and climate-related circumstances fluctuate. The information here is current at the time of writing, however. There is a tendency at the moment for only owners of very large residences to get solar panels installed. This can lead to a misconception that only owners of such residences—by suggestion, the very rich—can afford to get solar panels installed. It would be simplest to decide the issue of what makes a typical homeowner’s power requirements by picking from the rough middle of the spectrum. This would represent the socioeconomic income bracket where households typically consume around 300 kWh per month. How much do households like this usually pay in power bills per month? As of June 2015, such consumption would translate to generation charges of 1,336.68 pesos’ worth for MERALCO customers. Adding the ancillary charges would amount to a total power bill of 2,930.01 pesos for the same time period. The beauty of solar panel systems is that they can be designed to fit singular requirements. The flexibility of the technology permits installers to design entirely unique systems even for clients asking for the same reductions in their monthly power bills. This means, of course, that the bills involved can diverge quite starkly as well. Does this mean that it is impossible to return an estimate? Not at all. Returning to “typical household consumption” we settled on (300 kWh/month), let us say that the client demands a system that would render him entirely independent of the grid. This means he needs a system that can produce 300kWh or more per month. Let us assume the client lives in or around Manila, where the average sun hours would be 5hrs per day. This means that he requires a solar PV system with a size of 2.4 kW. Such a system would take care of all of his power needs, at least if the sun hours stay consistent throughout the days. And those are just a few of the factors involved. But roughly speaking, a 2.4 kW system would cost something in the region of 200,000 pesos at the time of writing. More than 70% of this will usually be for the materials alone. But again, remember that this is not a fixed estimate. Fill up this form to see our estimate for your current situation. The components in particular can cause a lot of price variance. This is because there has been a boom recently in the number of manufacturers and distributors of solar panels and related components. Where the market was previously dominated by European and Japanese manufacturers, there are now new players. These include China. Chinese-made solar panels, inverters, and batteries have taken over the market in the past few years due to the quantities in which they are made and their low pricing. Chinese-made products made 250-watt solar panels available at prices as low as 15,000 pesos just last year. Even now, the price is still dropping. As such, many cost-conscious installers will now immediately offer Chinese-made panels to customers looking to keep the total investment cost down. On the flip side, many are concerned about possible lack of quality in the components sourced from that country. It would be a lie to say the fears are entirely unfounded. There have been a few instances of less-than-ideal manufacturing from China in the past. But it is worthwhile to note that the country has been producing these components for some years now. This means that sufficient knowhow and experience has been built up to reduce possible manufacturing mistakes. Indeed, most of the most trustworthy installers now think nothing of offering some Chinese-made components to their clients, vouching for their reliability. Of course, it is always up to you to decide which components you want in your system. Whether it is an issue of something being Chinese-made or something else, it all boils down to your preferences. Provided your budget can meet it, there should be no difficulty in asking your installer for higher-cost or alternative-brand products during the planning process. Here at UnitedSolar Philippines, we only use Tier 1 solar panels manufactured by the top 3 brands in the world. Contact us today and we’ll send you a custom estimate that fits your needs.